Having greatly enjoyed reading Buried Secrets by Joseph Finder in August this year, I have been on a lookout for his other titles each time I went book shopping. It was such an excitement when I came across this title recently when I was least expecting it. Actually, I didn't bother much about the title. As long as it's written by Joseph Finder, I will certainly want it. Paranoia did not disappoint. It's a corporate espionage thriller which was both engaging and thrilling. I wasn't supposed to read this yet as I have a few other titles that take precedent but I was too impatient to wait. Character development can be better but plot wise, it was exciting and I am always a fan of twist in the storyline and I certainly got that. 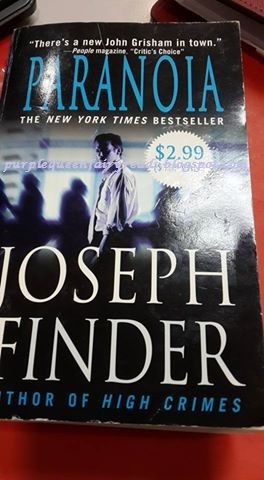 I think Joseph Finder is a wonderful thriller author and having just read two of his titles, I want more! By the way, a movie adaptation of this book was released in year 2013. If I am not mistaken, it's very different from the book. Knowing me, I prefer the book anyday.